Multipurpose Professional Straight-Cut 60 L Shredder for medium office use with continuous duty motor and heavy duty chain drive with steel gears. 1.9mm Strip Cut / DIN Security Level P-3 for sensitive & confidential data. More Info. The KOBRA 260.1 Classic Line Professional Multipurpose Series are the highest quality straight and cross-cut Mobile Shredders available with a 60 Litre Waste Collection Bin and 260mm (A4+) feed throat, which are perfect for continuous use in Medium Sized Offices. Depending on the shred size and model chosen (see below) the new Kobra 260.1 range can shred a variety of media like Paper (P), Film (F), Optical CD’s, DVD’s and Blu-ray (O), Magnetic (M) floppy discs and cards, and Electronic (E) cards,. 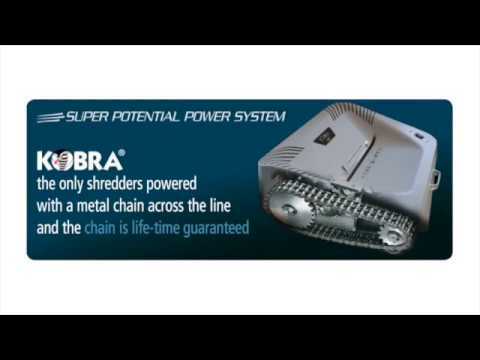 All Kobra 260.1 Shredders are equipped with a host of excellent features including CARBON HARDENED CUTTING KNIVES which are unaffected by staples and metal clips. The high precision design of cutting knives allows high shred loads using very low power consumption from the 24 HOUR CONTINIOUS DUTY MOTOR which is thermally protected. This means there is no duty cycle or timed cool down period so that you can shred for as long as you need to at any time. For High Security versions see Kobra 260.1 HS, and Kobra 260.1 HS-6.